11) The triage amalgamated dermatoscopic algorithm (TADA) method--in which clinicians first decide whether a lesion could be malignant--was shown to significantly increase the number of correct diagnoses ofbenign lesions. 7) study, fibrocystic disease was the commonest lesion to be associated with atypical ductal hyperplasia comprising of about 13 cases (30. Classification of oral pathological lesion according to their appearance, nature and origin is very important to reach to the correct diagnosis and eventually treatment. However a study described sensitivity and specificity of 64% and 69% in detecting neoplastic lesion using NAA/Cr with a significant p value. We can then directly compare the relative stiffness of a lesion based on its elastic properties in relation to the surrounding tissue. A pathologic fracture associated with a benign lesion would also have a periosteal new bone or callus formation. For 12 of these 61 incidental skin cancers (20%), the index lesion had been immediately ruled out as nonmalignant. 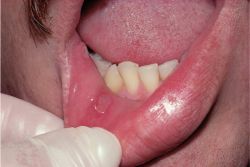 When confronted with an unknown lesion, the clinician could easily review the presented information to produce a dental hygiene diagnosis. 1) We were able to completely excise the lesion in our patient without causing any substantial cosmetic and functional deficit. Lucchinetti and other researchers are now trying to find non-invasive ways for identifying lesion patterns. Is MS more than one disease? The physical examination revealed a healthy-appearing 50-year-old male with no medical concerns other than the skin lesion. Untreated, the lesions progress to cervical cancer in a small percentage of women.